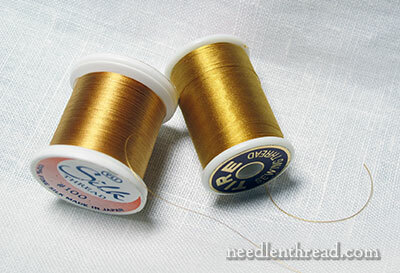 What thread are you using for couching the goldwork? Although I usually mention it within articles on the different goldwork techniques, I’ve never written an article devoted entirely to The Couching Threads. But you know, they deserve their moment in the limelight. They have an arduous task and they work hard to get it done. So they are, in fact, Important. Essential. Critical, even! Today, I’ll show you exactly which ones I use and tell you why. And, with an article devoted just to these indispensable little spools, from now on, I can just send a link when anyone asks. Here they are! Ahhhhhhhhh. I love the color of the thread on these two spools. They’re … liquid gold. First, they are Strong. Their strength is suited to their various tasks – depending on the weight of the goldwork thread being couched. And of course, they are generally reinforced with beeswax, which further strengthens them. Second, they are Silk. I find silk much more pleasant to stitch with than the polyester alternatives that are often used in goldwork. Third, they are the Perfect Color. They are not bright yellow. They are gold. And they blend into the goldwork threads with subtlety, whether the goldwork threads are bright gold or “old” gold. The thread on the left is 100 wt. silk by YLI, a Japanese thread company. The color number is 215. I use the 100 wt silk for very fine goldwork threads, like Elizabethan twist or gold tambour thread #7, or very fine purls, like bright check purl #10, which is exceedingly tiny and requires a very fine thread to pass through it. The thread on the left is 50 wt. Tire Silk, also a Japanese silk. The color number is 74. I use the 50 wt. thread for everything else – passing threads, pearl purls, purls, you name it. YLI makes a 50 wt thread as well, but not in color 215. The closest is color number 078 in the YLI 50 wt. I use both it and the Tire Silk above interchangeably. It just depends on what’s in the larder. Where can you find these threads? Wouldn’t it be nice if they were in the same spot? I haven’t found them both from one supplier yet. The Uncommon Thread (or Speedstitch – they’re the same now) is the least expensive place I’ve found the YLI 100 wt. Weir Crafts is the least expensive place I’ve found the Tire 50 wt., which they stock for Kumihimo. Uncommon Thread carries both weights – 100 and 50 – in YLI. The color number for the 100 wt, again, is 215, but the closest color in 50 wt is 078. Price-wise, the spools may seem expensive, but they last Forever! So there you have it – those my favorite couching threads. Use ’em all the time. What about you? 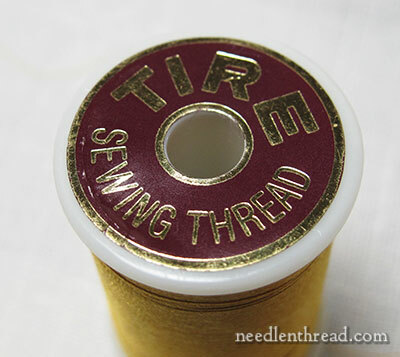 Do you have any other recommendations for good couching threads to use for goldwork? Feel free to share your insights below! Intesting! I have never encountered those ones before. I love the idea of couching in silk, and silk is the perfect fibre for the job. When I was taught. it was with waxed bog standard polyester cotton machine thread, but I can categorically NOT recommend it! the purls will shred it in minutes, and it is oddly visible, even if the colour matches well. I think because it lacks lustre more than anything. When I went to a workshop with Hazel Everett, she advocated madeira heavy metal thread. It is very flexible and very strong (it really does have a metal component), and in comes in several shades of gold and silver it has a lovely metalli glow that is a true metallic, not glitzy sparkly like you see in “metallic” embroidery threads. it is practically invisible in use, and it never shreds or tangles. you can happily use it to “brace” your purl against whilst you guide it around a corner, and it is good for laying or looping cut purls. It also makes a very nice, fine thread for laying down tiny sections of lattice etc, like a butterfly’s wing. the effect is quite subtle. But I think I would prefer a finer, more supple thread for finer work like couching passing threads for vermicelli etc. and you can never have too many thread choices, let’s face it. Mary, first, you are not “lazy”, you merely decided to add another great subject to your encyclopedic website. I had not seen these threads anywhere, so I appreciate your pointing us in the right direction. I will order a spool from each of the companies this morning. Again, thank you for all you do to educate those of us in the hinterlands. It is appreciated more than you can know. I have to admit it but I have been using a fine molofilament thread doubled over with a slipknot in the needle’s eye and knotted with a chubby ole knot at the tail. It is very strong and it is pretty invisible. At first I did not like working with the springiness of the molofilament but now I just ignore it’s malbehavior. It seldom knots up as it passes through the ground cloth and it is easy to unkot if it does manage to snarl. Hello from Australia..Many thanks for this informative piece..I have been unhappy with the polyester Guterman’s machine thread that has been suggested in the past..too bulky and therefore can be seen between the purls. But now I’d like your suggestion for a colour in these silks for silver purls etc. Sorry to bother you..can’t wait to share this info with my Guild stitching friends!! Thank you for sharing your love of stitching – I treasure my daily dose! I have not tried couching yet. 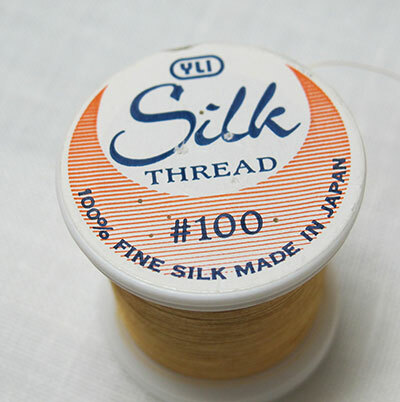 I can recommend the YLI silk 100 threads. I slowly purchased many colors from Uncommon Thread. I use the YLI silk 100 for needleturn applique. It blends into the fabric and disappears. I started with purchasing neutrals (grays, beiges, etc.) and then added colors that I frequently use (greens for leaves, blues, yellow and gold). The thread is fine and usually does not have to be an exact match to fabric. How close you would match it to couching material would depend on the effect you want. I have never used the YLI Silk 50. My budget is limited, so I use the Mettler cotton 50 if I don’t have a close enough color silk 100. Daniece, I am in the very middle of the state, both population wise and distance wise. We are in Killeen, just outside of Fort Hood. We have about 1/4 million people around here, but because there are so many military people we lack good shops. About 20 miles away we have a fairly new cross stitch shop where I get a lot of my threads, and we just had a bead shop open about a year ago. The nearest real fabric store is about 25 miles away, but they only have quilting cottons and batiks. For Joann’s I have to go to Austin, an hour each way. Several times a year we get down to San Antonio to see grandkids and I have found a huge machine, fabric, and thread store that I try to visit each time we are there. Until Mary’s article this morning I had never thought much about silk thread on spools. I have a lot of silk for embroidery, but all in divisible forms. 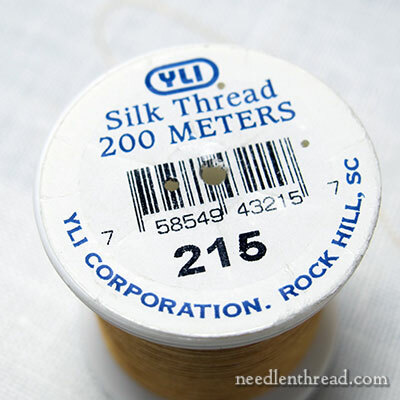 I have seen the YLI silk thread before, but I had never thought of using it. For my applique work I have used Aurifil threads for the last 10 years or so. Mary is a treasure for those of us away from the mainstream, and I have learned so much from her articles. I began doing embroidery about 60+ years ago, and now most of my work is in crazy quilting, but I have never really been in a position were I could be around those who also enjoy needlework. The cross stitch store is about the closest I have been to a place where I could sit down with other women while we stitch and chat. I try to get there a few times a month. Life is good and Mary is making it even better! I agree with everything you have pointed out concerning silk thread for couching I love using the YLI 100wt 215 silk thread and as you say it is strong and like you I love working with silk and the colour is perfect. I just wish I could buy the YLI 50wt or the Tire 50 wt but alas I’ve just been researching the web but they don’t seem to be available in the UK. Thanks for sharing this with us. I don’t like using yellow threads either. Actually, on the few occasions I’ve done gold douching, I’ve just used the finest metallic thread I had that matched the colour of the thread I was couching. Something like Kreinik Cord, or Japan thread #1. As you can see, I’m no specialist!! 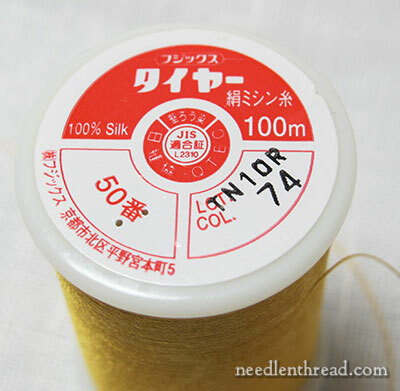 I want to take up goldwork and so I’d like to use my 0.12 mm thick invisible thread (not sure if it is polyester or nylon) for couching rough purl(monofilament silk thread isn’t available in my country and I have a hard time matching the shade of regular polyester thread to the purl’s shade). Does this thread also have to be coated in beeswax? Any kind of thread should be waxed when doing goldwork, to avoid abrasion from the metal threads. Hope that helps! Thank you for the advice Mrs. Corbet. Also, can art silk (i.e. rayon) be substituted for the silk thread for couching? Try Red Rock Threads. They carry the TIRE and YLI brands, as well as many other sewing and embroidery threads. I was told about it from a friend when I was opining about the #60 all cotton thread that used to be readily available before the cotton-wrapped polyester and all polyester threads took over the market. Thank you for all the wonderful videos, patterns, and descriptions for all the hand embroidery.